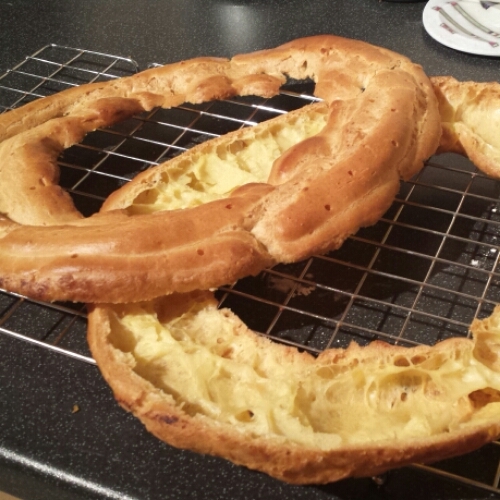 Choux-laa-laa… A Paris-Brest of sorts. 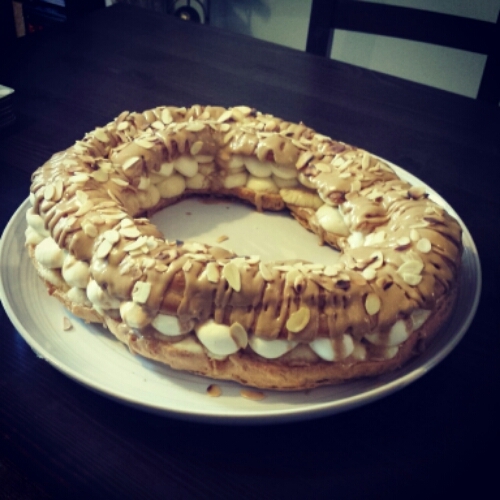 The iconic Paris-Brest dessert was created in honour of the Paris to Brest bike race which started in 1891. 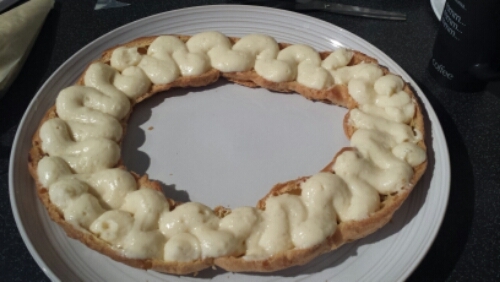 Circular in shape to represent a bicycle tyre, and typically filled with a praline cream, this choux pastry sensation can still be found in patisseries all over France. 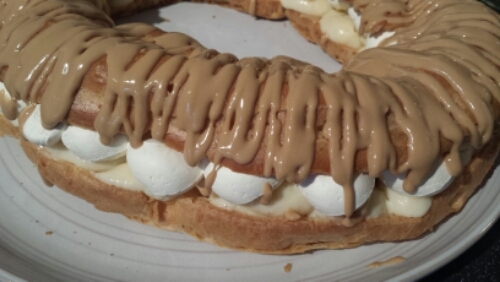 There’s an incredible garden centre near us which makes amazing cakes and pastries, my favourite of which is a Coffee Renoir, which they make in the same shape as a Paris-Brest. 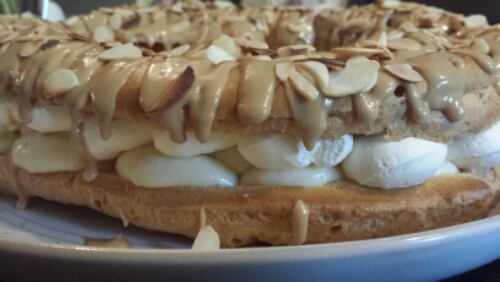 It’s filled with pastry cream and whipped cream, then doused in coffee icing and almonds. 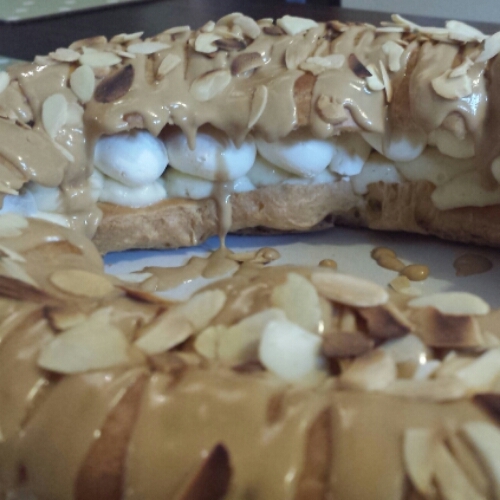 I’m a sucker for anything with creme pat in it, so thought I’d have a go at recreating it at home. Granted, my bike tyre looks like it has a puncture, but hey ho, looks aren’t everything! Put the butter and water in a pan and heat until it starts to simmer. At this point dump in all the flour and sugar and beat hard with a wooden spoon. If your bingo wings aren’t flapping you’re not beating hard enough! The dough will form a smooth ball. Leave to cool until it’s tepid then drizzle in the beaten eggs a bit at a time beating hard again until the egg is incorporated before adding more. You should end up with a glossy paste. 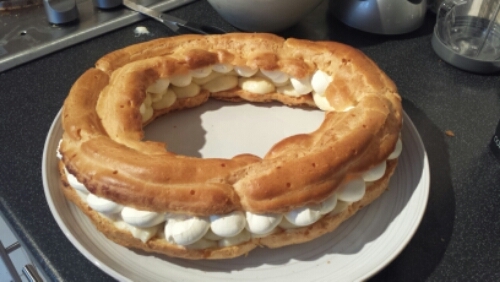 Put it in a piping bag and pipe a circle on a well greased baking sheet. Pipe another circle touching the inside of the first one, then a third one on top of the first two. Bake at 210oC for 15 minutes, then, without opening the oven door turn the temperature down to 180oC and bake for a further 15-20 minutes until crisp and golden. Remove from the oven and immediately poke repeatedly with a skewer to let the hot air escape and avoid the dreading shrinking choux. When cool enough to handle carefully slice into two halves and allow to cool completely. 1 vanilla pod, split, seeds scraped out. Heat the milk in a pan with the vanilla pod and seeds gently until it comes to a simmer. Meanwhile whisk the eggs and sugar together until light in colour then whisk in the cornflour. Sieve the milk mixture into a jug and pour half of it back into the pan. Slowly pour the remaining milk into the egg, sugar and cornflour mixture whisking continuously. Then pour the egg mixture back into the pan with the other half of the milk and whisk until it has thickened. Put into a clean bowl, cover with clingfilm and refrigerate. 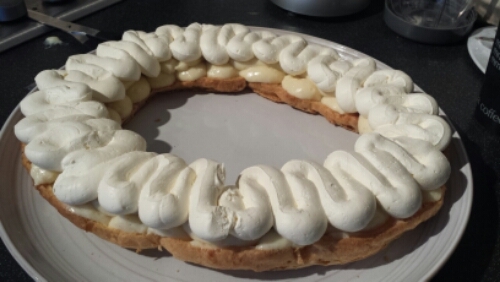 Once it has chilled and set pipe it onto the bottom half of the choux circle. Now whip some cream with icing sugar to sweeten and a teaspoon of vanilla. 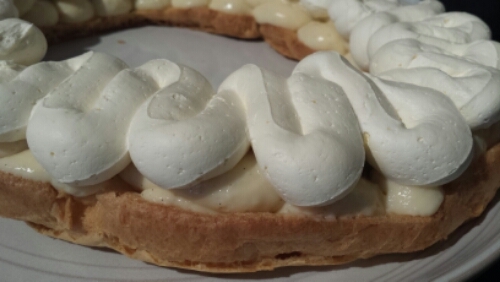 The cream needs to hold its form, but be careful not to over whip. Pipe it on top of the creme pat. 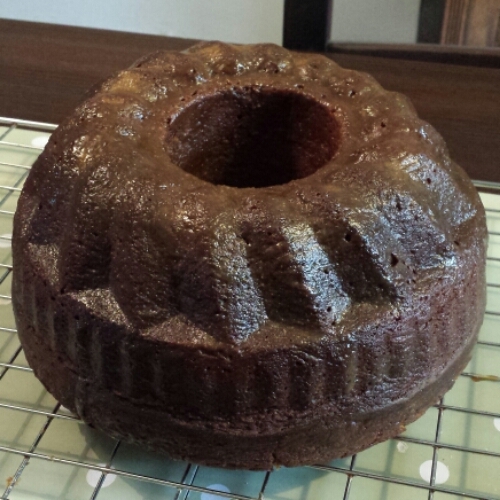 Put the top on and drizzle with coffee icing. To make the icing dissolve a heaped teaspoon of instant coffee in a tiny amount of boiling water to make a bit of a paste. 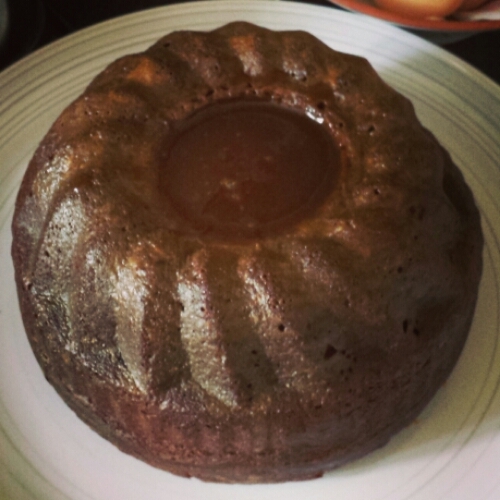 Once cooled pour the paste a bit at a time into some sieved icing sugar. Taste. Add more sugar or coffee to taste. Pipe over the top and sprinkle with almond slices. 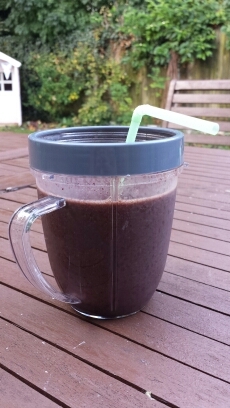 I recently discovered the joys of the Nutribullet after my juicer broke down. As much as I love juicing, the hassle of cleaning the machine afterwards is not appealing at all. I wanted something simpler and easy to clean. Although not strictly a juicer (it’s marketed as an extractor), the Nutribullet came to my rescue. So unbelievably quick and easy with minimal clean up, I still feel like I’m getting all the benefits of juicing with the added perk of the fibre still being included, as the pulp is filtered out with a juicer. 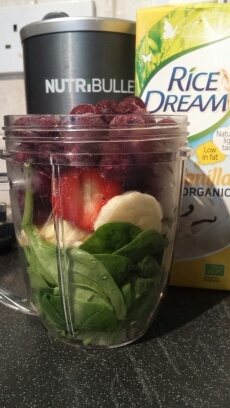 You can still use raw veggies and the Nutribullet will pulverise them into delicious smoothies, even if they’re frozen! I’ve used beetroot, broccoli, apples, avocado, berries, spinach, banana and carrots all with great results. 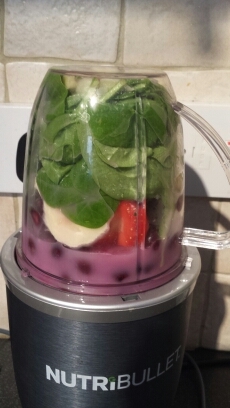 This morning I had spinach, frozen blueberries, strawberries and half a banana with a piece of fresh ginger to give it some bite, all topped up with coconut rice milk. A perfect pre-workout pick-me-up. Aside from the fact it will literally blend anything (nuts and seeds included), the cup and blade are the only things that need cleaning! Perfect on so many levels. I’d highly recommend if you’re looking into buying a smoothie maker or juicer. 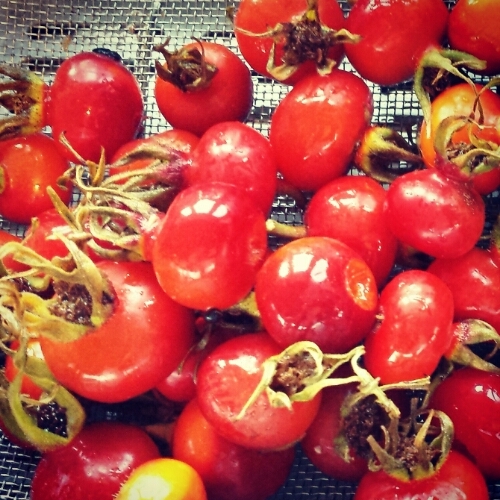 Rose hips have long been used as an immune system booster, reportedly containing 50% more vitamin C than oranges. It’s no wonder these shiny little autumnal powerhouses have been made into syrup and gleefully spooned into mouths winter after winter. 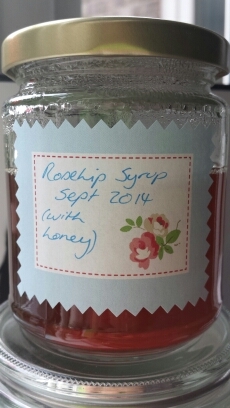 Instead of using just sugar for the syrup I decided to experiment with Manuka honey to really give this syrup a health boosting kick. Unfortunately, I only had a small amount of rosehips, but that’s part of the fun of foraging I guess, making the most of what the land gives you. Wash the rose hips and cut in half removing the furry whiskers where the stalk attaches (don’t worry too much if you miss a few as we’ll be straining through a muslin later). 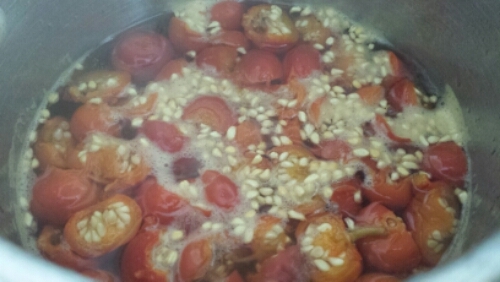 Throw them into a saucepan, seeds and all, and cover with boiling water. The exact amount really doesn’t matter too much at this stage. Boil for 15 minutes before breaking them up a bit with a potato masher (obviously do not drain). Once mashed, boil for another 5-10 minutes. Add more water at any time during this process should it be evaporating too quickly. 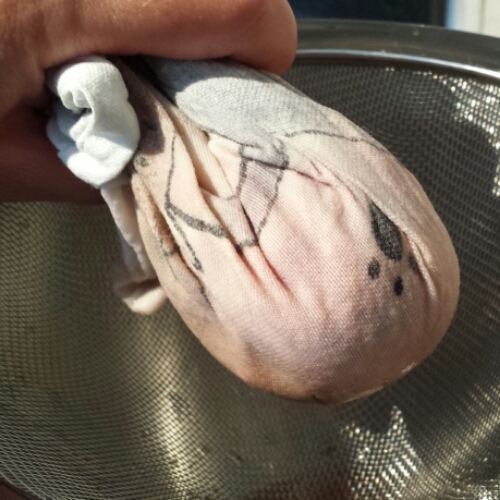 After 20/25 minutes line a sieve with a clean tea towel or muslin and drain the mixture. Let it sit there until the pulp is cool enough for you to squeeze the remaining juice out of. Now, pour the flavoured water into a measuring jug and take note of how much liquid you’ve got. 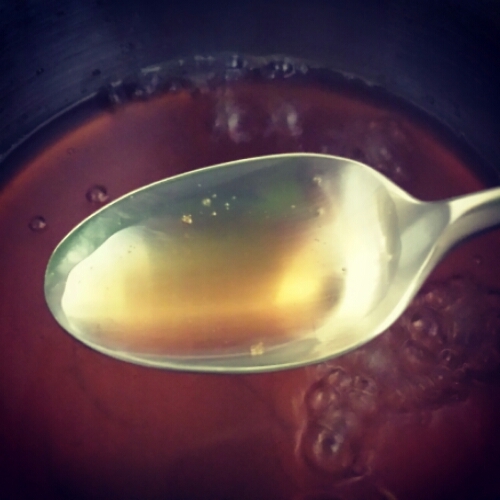 How much sugar and honey you add depends on how sweet and thick you want the syrup. I ended up with 250ml water and added two tablespoons of sugar and two of honey. I poured the water back into the pan with just the sugar and allowed to come to the boil and reduce. I purposely didn’t add the honey at this stage as I wanted to limit the amount of damage done to the goodness of the honey through the heating process. 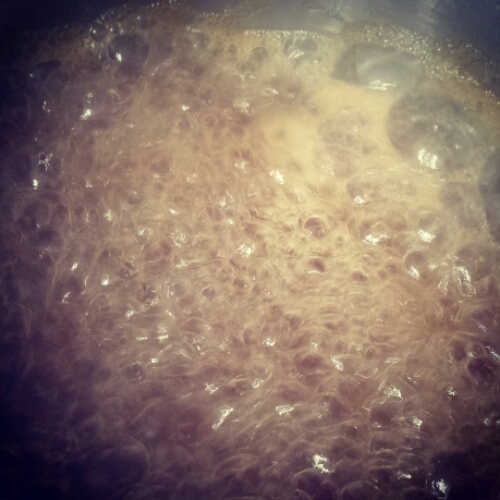 After about ten minutes I added in the two tablespoons of honey and allowed it to melt into the mixture without boiling. 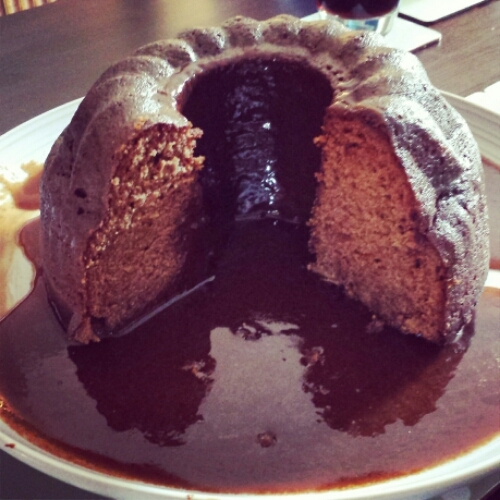 The result is delicious! I put it in a sterilised jar and will be looking forward to enjoying a teaspoon or two a day be it over yoghurt, in my morning smoothie or simply off the spoon.